So you’ve decided to rent a charter vehicle. Congratulations! It probably means that you have a fun and important occasion happening, one that a lot of your friends, relatives, or colleagues are going to get to participate in. 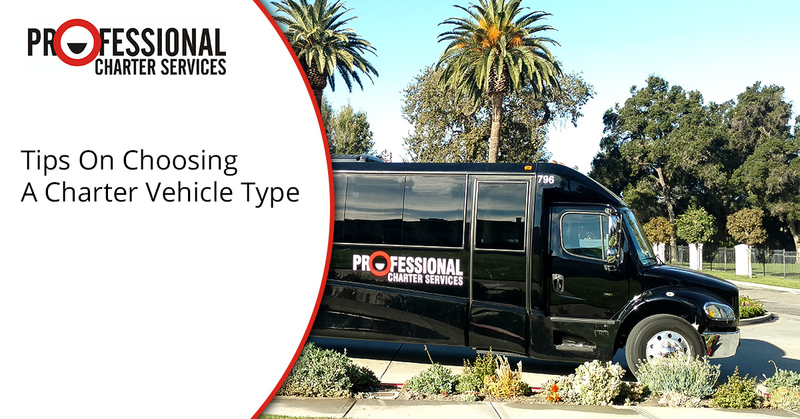 Here at Professional Charter Services., we rent charter buses, mini buses, and other vehicles in the San Francisco area to groups of all shapes and sizes. However, if it’s your first time renting a charter bus, you may be wondering what type of vehicle you need. Here are our tips for choosing the vehicle that will fit your group perfectly. Do they need and expect the highest-caliber accommodations, or will a more economy vehicle suit them just fine? Do you have any children in the group? Do you have any people who will need special accommodations (such as wheelchair accessibility)? Knowing these details upfront will save you time and headaches in the long run, as they will help to prevent you from making a choice that later turns out to be inappropriate for your needs. The longer your trip, the more difficult it is for people to sit on a bus, and if you have a few extra seats, it can provide your guests a welcome change of seating if they get tired and cramped. However, choosing a bus that’s much larger than the size of your group will inevitably affect the price of your transportation. Also, if you have numbers of people whose RSVP isn’t confirmed and you’re not sure if they’re coming until the last minute, it might occur to you to try to get a bus that’s one step larger than you actually need, just in case those people need a seat after all. However, you’ll need to know what your budget can accommodate so that you can determine whether that is a viable option. One of the best ways to familiarize yourself with the charter vehicle options that are available to you is to look at the photos of our fleet. We offer details on how many seats our buses have, along with exterior and interior photos of them, so that you can always see what they look like and have a good idea of exactly what you’re reserving. We are proud of our well-maintained charter vehicles, and we know you’ll enjoy riding in them. When you call us on the phone, we’ll ask you a few brief questions to understand the size and purpose of your event, and then we’ll be able to make a recommendation to you based on what is available in our fleet. Check out the photos of the gorgeous charter buses we have on our lot, and give us a call today to get your free reservation quote.